modified from McLemore, V.T., 2002, Navajo Lake State Park: New Mexico Geology, v. 24, no. 3, p. 91-96,103. Figure 1 – Location of Navajo Lake State Park. Navajo Lake State Park, which includes the second largest reservoir in the state (Elephant Butte is the largest), is in the Four Corners region of northwestern New Mexico, 25–30 mi east of Bloomfield (Fig. 1). Navajo Dam was built in 1958–1962 by the U.S. Bureau of Reclamation for flood control, recreation, sediment control, and to provide water to the Navajo Indian Irrigation Project, one of the many projects of the basin-wide Colorado River Storage Project established in 1956. The Navajo Indian Irrigation Project, founded in 1962, provides water for approximately 110,000 acres of farmland on the Navajo Indian Reservation. The dam traps water from the San Juan, Piedra, and Los Pinos Rivers and Sambrito and La Jara Creeks. The dam consists of an earth- and rock-filled structure that extends 3,648 ft across the San Juan River and is 402 ft high at an elevation of 6,085 ft (McLemore, 1997). In the reservoir area, five cemeteries, 4 miles of Colorado state highway, and 6.5 miles of railroad were relocated. The city of Farmington has operated a 30-megawatt hydroelectric power plant at Navajo Dam since 1987. When full, the reservoir covers 15,590 acres. Piñon, juniper, mesquite, and yucca cover the hillslopes and mesas surrounding the lake, and various wild flowers and cacti, including cholla and prickly pear, are common. Cottonwood and poplar trees are found along the river valleys. Falcons, mountain bluebirds, quail, dove, ducks, and geese are plentiful. Upland bird (quail, dove) and waterfowl hunting is allowed within the park boundaries along the San Juan River. A few bald eagles and peregrine falcons inhabit the area as well. Antelope, elk, and mule deer roam the countryside; big game hunting is allowed outside park boundaries. A few mountain lions and bear roam the adjacent hills. Figure 2 – Geographic features of the southeastern Colorado Plateau; dashed line shows an approximate boundary for the Colorado Plateau. Colored relief map reprinted by permission of Chalk Butte, Inc. Scale shows elevation from –232 ft to 14,433 ft.
Navajo Lake lies in the eastern part of the Colorado Plateau, a unique geologic province that has undergone relatively little deformation compared to the areas surrounding it (Woodward et al., 1997; Baars, 2000). 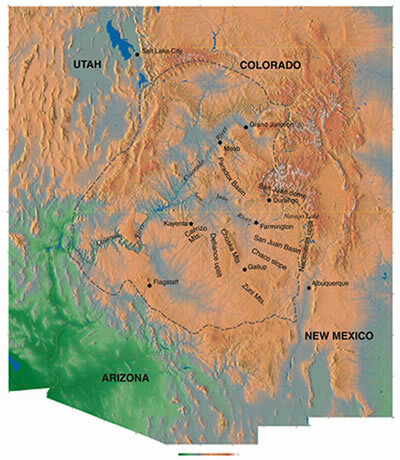 The Colorado Plateau includes parts of New Mexico, Arizona, Utah, and Colorado and is divided into several basins and other tectonic features (Fig. 2). Navajo Lake lies in the San Juan Basin, which is bordered on the west by the Defiance uplift and the Chuska Mountains, on the north by the San Juan dome, on the south by the Chaco slope and Zuni Mountains (McLemore, 1998b), and on the east by the Nacimiento uplift (Nacimiento and San Pedro Mts. ; Fig. 2). Approximately 12,000 ft of rocks ranging in age from Cambrian through Tertiary are preserved in the San Juan Basin and elsewhere on the Colorado Plateau (Figs. 3 and 4; Green et al., 1991). Only Tertiary and Quaternary rocks are exposed at Navajo Lake (Manley et al., 1987), but older rocks lie beneath the surface and helped to shape the land as we now see it. Figure 3 – Generalized geologic map of the northern San Juan Basin (Beaumont, 1982; Green et al., 1991). The Paleozoic and Mesozoic rocks in the San Juan Basin were deposited on a relatively stable continental platform and are products of sedimentary depositional systems that covered the entire Colorado Plateau and beyond (Green et al., 1991; Baars, 2000). The San Juan Basin area was occupied by a seaway connecting the central New Mexico sea with the Paradox Basin in Utah during most of pre-Permian time (Baars, 2000). During Jurassic time, a desert environment covered much of what is now the San Juan Basin, and sediments were deposited in dune fields, playas, saline lakes, fluvial systems, and alluvial aprons. A large salina formed in the center of what is now the San Juan Basin, and the Todilto Limestone was deposited. Gypsum, limestone, and uranium were produced from the Todilto in the southern San Juan Basin, and uranium was produced from sandstones of the Jurassic Morrison Formation, which is younger than the Todilto Formation (McLemore and Chenoweth, 1989). This desert environment continued into Late Jurassic time; by Late Cretaceous, approximately 100 million years ago, the predominant depositional environment changed as a vast but shallow sea covered much of New Mexico, including the San Juan Basin area. Marine and coastal, nonmarine environments shifted through time across the San Juan Basin, depositing coal (Hoffman, 1996, 1997), sandstones, siltstones, and shales. By 65 million years ago, the sea retreated, and the structural San Juan Basin had begun to form. The Tertiary sediments that filled the San Juan Basin were derived from the San Juan Mountains and the southern tip of the Rocky Mountains, which were uplifted in Late Cretaceous to early Tertiary time, 80–40 million years ago (Green et al., 1991). As the basin subsided the mountains uplifted, eroded, and filled the basin with sediments. The uplift produced coarse sediments that were transported by the streams and rivers into the deeper parts of the basin. These strata are easily seen in the canyons cut by drainages of the San Juan River and at Navajo Lake. The sediments are named the McDermott, Animas, and San Jose Formations. Sandstones and interbedded mudstones form the shoreline and adjacent cliffs along Navajo Lake and San Juan River, and belong to the Eocene San Jose Formation, which makes up most of the area surrounding Navajo Lake (Fig. 3; Manley et al., 1987). The San Jose Formation is fluvial in origin and consists of 200–2,700 ft of red to pinkish conglomerate, red to tan to white sandstone, and variegated red to tan shale (Stone et al., 1983; Smith, 1992). Conglomerate pebbles and clasts include eroded fragments of Precambrian quartzite and younger sandstone and siltstone. The unit was deposited along high-energy, low-sinuosity streams and on adjacent muddy floodplains. The formation consists of five members: basal Cuba Mesa, Regina, Ditch Canyon, Llaves, and upper Tapicitos Members (Smith, 1992), but only the Llaves and Regina Members are exposed at the lake. The youngest rocks overlying the San Jose Formation are Quaternary valley-fill and terrace gravel, sand, silt, and clay that were deposited in alluvial fan and fluvial environments over the last million years or so (Stone et al., 1983; Baars, 2000). Petroleum, natural gas, and mineral production form the basis for an important industrial economy in the Four Corners region. The Cretaceous and Tertiary sedimentary rocks that fill the San Juan Basin are both sources and natural reservoirs for oil and gas—both formed by slow decomposition of plant and animal material that accumulated in the sediments. Over millions of years bacteria within the lithified sediments we call source rocks transformed the trapped and preserved organic residue into hydrogen- and carbon-rich compounds. Increased pressure and heat from the weight of the layers above then caused a partial distillation of the hydrogen and carbon compounds, transforming them into crude oil and natural gas. The earliest known well to encounter natural gas in New Mexico was drilled in 1896 by a farmer named Blake near the confluence of the Animas and San Juan Rivers (Energy, Minerals and Natural Resources Department, 2000). Actual production of natural gas did not begin until 1921 when a natural gas well was drilled south of Aztec, and gas was piped into Aztec for lighting in homes (Energy, Minerals and Natural Resources Department, 2000). Most of the natural gas produced in New Mexico comes from the San Juan Basin, and New Mexico ranks second in natural gas production and second in onshore proven gas reserves of all producing states in the United States (Energy, Minerals and Natural Resources Department, 2000). Significant production and reserves of crude oil also are found in the San Juan Basin (Energy, Minerals and Natural Resources Department, 2000). Meridan Oil, Inc., constructed an excellent educational display in the park at the 5,330-ft-deep Munz H1R well along NM–527. Another source of energy produced from the San Juan Basin is coalbed methane. As much as 50 trillion ft3 of coalbed methane is found in the Fruitland Formation in the San Juan Basin (Bland, 1992). Coalbed methane is a type of natural gas that is generated within coal seams and is pumped from wells similar to those that produce natural gas and crude oil. The methane is actually a hazard if released during coal mining because it is explosive and a spark generated by mining could create an explosion within the mine. Coal originates from plant material such as ferns, trees, bark, leaves, and seeds that accumulated and settled in swamps. This unconsolidated accumulation of plant remains is called peat. When the layers of peat are covered by sediment and subjected to heat and pressure from the subsidence of the swamps, a metamorphic process called coalification forms coal. Coal is a solid, brittle, more or less distinctly stratified combustible carbonaceous rock, and it varies in color from dark brown to black. The coal locally is as much as 17 ft thick; scientists estimate that it takes 3–10 ft of compacted plant material to form 1 ft of bituminous coal (Energy, Minerals and Natural Resources Department, 2000). Coal was found in the Late Cretaceous Fruitland Formation near Farmington in the late 1800s, but very little coal was mined before 1953. Navajos mined small quantities of coal from the area for heating their homes. Three mines were operating in 2002: the Navajo mine, supplying coal to Arizona Public Service Company’s Four Corners generating station; the San Juan mine, supplying coal to Public Service Company of New Mexico’s (PNM) San Juan generating station; and the La Plata mine, also supplying coal to PNM’s San Juan generating station. Both the San Juan and La Plata surface mines will close at the end of 2002; underground mining has begun at the San Juan mine. Outcrops containing vanadium and uranium minerals were discovered by John Wade in 1918 in the Carrizo Mountains (Fig. 2) in northeast Arizona and northwest New Mexico (Chenoweth, 1997). As the outcrops were on the Navajo Reservation, mining could not begin until 1919, when the reservation was opened to mineral prospecting and mining. In 1920 approximately 40,000 lbs of ore was mined for its radium content and shipped from the Carrizo Mountains to Colorado. Little exploration occurred on the reservation until 1939, when companies began exploration for vanadium. During 1942–1947, 18,269 tons of ore containing 812,923 lbs V2O5 was mined from the area and shipped to Monticello, Utah, and Naturita and Durango, Colorado, for the strategic stockpile (Chenoweth, 1997). During 1943–1945, approximately 76,000 lbs of U3O8 was secretly recovered from the tailings piles for the Manhattan Project. Mining for uranium began in 1948 and continued until 1967; 119,706 tons of ore averaging 0.22% U3O8 and 1.93% V2O5 was produced from the Carrizo Mountains. Due to post-mining environmental problems and low-grade deposits, it is unlikely that any additional production from the area will occur. Some of the uranium mines have since been reclaimed. Baars, D. L., 2000, The Colorado Plateau, a geologic history: University of New Mexico Press, 254 pp. Beaumont, E. C., 1982, Geology of New Mexico coal deposits and geologic setting for field trip; in Coal-bearing sequences and modern concepts for exploration and development: American Association of Petroleum Geologists short course, March. Bland, D. M., 1992, Coalbed methane from the Fruitland Formation, San Juan Basin, New Mexico; in Lucas, S. G., Kues, B. S., Williamson, T. E., and Hunt, A. P. (eds. ), San Juan Basin IV: New Mexico Geological Society, Guidebook 43, pp. 373–383. Chenoweth, W. L., 1997, Summary of uranium-vanadium mining in the Carrizo Mountains, Arizona and New Mexico, 1920–1968; in Anderson, O. J., Kues, B. S., and Lucas, S. G. (eds. ), Mesozoic geology and paleontology of the Four Corners region: New Mexico Geological Society, Guidebook 48, pp. 267–268. Energy, Minerals and Natural Resources Department, 2000, New Mexico’s natural resources; data and statistics for 1999: Energy, Minerals and Natural Resources Department, Mining and Minerals Division, Annual Report, 68 pp. Green, M. W., Mytton, J. W., Sandberg, D. T., and Gardner, N. K., 1991, Geologic framework and major coal-bearing formations of the San Juan Basin; in Coalfields of New Mexico—geology and resources: U.S. Geological Survey, Bulletin 1972, pp. 1–14. Hoffman, G. K., 1996, Coal resources of New Mexico: New Mexico Bureau of Mines and Mineral Resources, Resource Map 20, 22-page text, 1 sheet, scale 1:1,000,000. Hoffman, G. K., 1997, Coal mines in the vicinity of Farmington, N. M.; in Anderson, O. J., Kues, B. S., and Lucas, S. G. (eds. ), Mesozoic geology and paleontology of the Four Corners region: New Mexico Geological Society, Guidebook 48, p. 44. Manley K., Scott, G. R., and Wobus, R. A., 1987, Geologic map of the Aztec 1º x 2º quadrangle, northwestern New Mexico and southern Colorado: U.S. Geological Survey, Miscellaneous Investigations Map I-1730, scale 1:250,000. McLemore, V. T., 1997, Navajo Lake State Park; in Anderson, O. J., Kues, B. S., and Lucas, S. G. (eds. ), Mesozoic geology and paleontology of the Four Corners region: New Mexico Geological Society, Guidebook 48, pp. 39–40. McLemore, V. T., 1998b, Bluewater Lake State Park: New Mexico Geology, v. 20, pp. 44–46. McLemore, V. T., and Chenoweth, W. C., 1989, Uranium resources in New Mexico: New Mexico Bureau of Mines and Mineral Resources, Resource Map 18, 37 pp. New Mexico State Parks, 2002, Interpretive master plan for Navajo Lake State Park: New Mexico State Parks, 29 pp. Schaafsma, P., 1962, Rock art of the Navajo Reservoir: El Palacio, v. 64, no. 4, pp. 193–212. Smith, L. N., 1992, Stratigraphy, sediment dispersal and paleogeography of the Lower Eocene San Jose Formation, San Juan Basin, New Mexico and Colorado; in Lucas, S. G., Kues, B. S., Williamson, T. E., and Hunt, A. P. (eds. ), San Juan Basin IV: New Mexico Geological Society, Guidebook 43, pp. 297–309. Stone, W. J. Lyford, F. P., Frenzel, P. F., Mizell, N. H., and Padgett, E. T., 1983, Hydrogeology and water resources of the San Juan Basin, New Mexico: New Mexico Bureau of Mines and Mineral Resources, Hydrologic Report 6, 70 pp. Woodward, L. A., Anderson, O. J., and Lucas, S. G., 1997, Tectonics of the Four Corners region of the Colorado Plateau; in Anderson, O. J., Kues, B. S., and Lucas, S. G. (eds. ), Mesozoic geology and paleontology of the Four Corners region: New Mexico Geological Society, Guidebook 48, pp. 57–64. Young, J. V., 1984, The state parks of New Mexico: University of New Mexico Press, Albuquerque, 160 pp.